When you travel with an Apple computer (or Microsoft Surface), often you bring three dongles with you; One for HDMI, one for DVI, and one for VGA. That way you always have the right adapter with you if you need to connect to a projector or TV at a conference room or hotel. Well, now you can just carry one adapter! 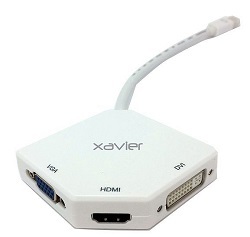 The Xavier MDP-3HD has them all-in-one!